They either have no experience creating them or fear the time and effort involved. Sure, it can feel intimidating from a tech standpoint, but building a variety of dedicated landing pages to fit your campaign efforts isn’t as challenging as you think. Fortunately, we can help alleviate this anxiety with our WYSIWYG landing page builders where you can save your custom templates. You have enough on your plate; we’ve got the tricky part handled. Still not convinced that landing pages can make a difference in your campaigns? With well structured, engaging, and interactive landing pages, converting leads into opportunities has never been easier (1). In fact, companies see a 55% increase in leads (2) when they increase the number of landing pages they have (from 10 to 15). 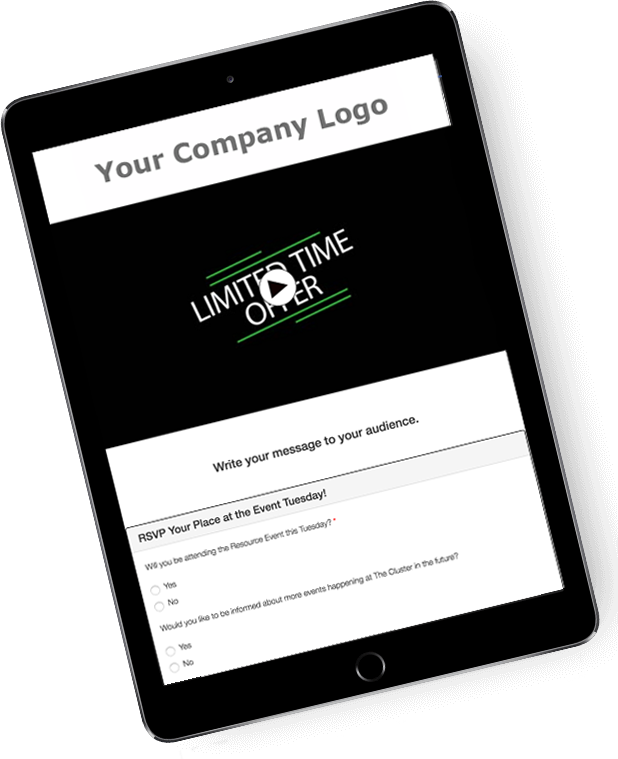 A well-crafted video squeeze page can help you gain that coveted email address that many are afraid to entrust you with. The average landing page conversion rate (3) is about 2.35%, yet the top 25% are converting at 5.31% or higher. Ancom (5) study reveals that adding a video on landing pages can increase conversion by 80%. Grasp a deeper understanding of your customer base with data tracking including who clicks which links, length of video viewed, personal devices your videos and landing page templates are viewed on and the location of viewing. Our landing page distribution techniques allow you to distribute your video messages across a multitude of mobile communication channels including social media, emails, SMS and QR codes. Your communications team can build strong campaigns easily with our landing page builder and templates, with ease and without excess effort or time. Highly flexible and customisable landing page builders allow you to add headers, logos, images and colours of your choosing. Save previous landing pages templates for future campaigns. Easily attach surveys, questionnaires and competitions to your video squeeze page. Build your landing pages from scratch without any IT or agencies required. Ability to customise text content and video style within our landing page builder and templates. Add clickable call to actions, downloadable documents along with social media buttons to increase engagement and conversions. More landing pages offer additional ways to pique the interest of your customers while keeping them engaged and comfortable trusting (6) their valuable information with you. Landing pages play multiple roles in communications, engagement and the ability to drive an audience to act. From micro learning to increased lead generation, landing pages combined with video can easily enhance your campaign. Now that you have an understanding of why they are important and how to build them, check out VidCorp’s cost-effective and flexible all in one online video platform that has all the tools you need to distribute, engage and analyse.